Abstract: There is plenty of hype around the term Web 2.0. While the change of the web has gathered increased attention from the Web 2.0 community itself, it seems that the corporate world feels unconfident how to apply the principles of the Web 2.0 to their businesses. Due to the ambiguity and fuzziness of the concepts describing Web 2.0 there is a lot of uncertainness. Highly affected industry branches like the media industry show interest but their fears of loosing their competitiveness because of not knowing how to handle the phenomenon Web 2.0 are evenly strong. 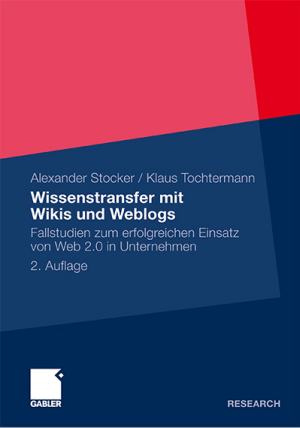 Nevertheless, little academic work has been conducted on the implication of Web 2.0 to the business domain. This paper bridges the gap in having a deeper look into the phenomena of Web 2.0 leading to the development of a more graspable model for corporate use of Web 2.0 encapsulating a business focus and hence defining the term Corporate Web 2.0. By showing how the introduced model is applied, it helps companies including the media and other businesses to derive a business value from the new Internet. Zitat: Stocker, Alexander; Us Saed Anwar, Dösinger Gisela; Wagner, Claudia: The Three Pillars of Corporate Web 2.0: A Model for Definition, in: Proceedings of Triple-I`07, Graz, Austria, Septermber 2007.